The Liberals and Progressives plaguing America, as represented by the Democrat party, have long held that, if at first – or ever – you don’t succeed, it’s not your fault and we need to change the victory conditions. At the same time they hold that, if you did succeed, it wasn’t to your credit and you owe others for your success. 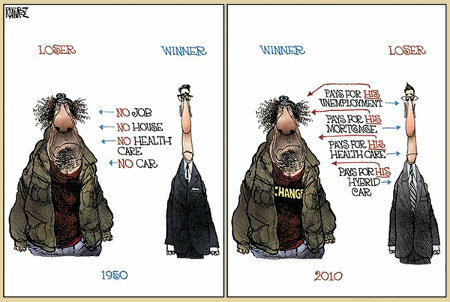 So, since 1950 and the concomitant and synergistic rise of the Welfare State and the Civil Rights Movement, they’ve managed to change the losers and winners in society by declaring that the losers are owed success or, at least, government-mandated and government-distributed subsistence at an ever-increasing level – all to be paid for by the “winners” in America. This has got to change and change swiftly. If it doesn’t, America is doomed. It will fail and drown in the effluvia of the eaters and takers, who have already been allowed to grow to outnumber the makers. The 2014 midterm elections are fast approaching. We each and all need to do what we can to remove the parasite enablers of the Democrats from office and replace them with lawmakers who will restore some measure of freedom to succeed and enjoy the earned privileges of success to the productive in our nation. This entry was posted on Monday, April 28th, 2014 at 9:06 am and is filed under 2014 Election, Politics. You can leave a response, or trackback from your own site. Those last two paragraphs say it so perfectly. Blessed Be.